Peel and devein the shrimp, leaving only their tails attached. (Reserve the shells, if desired, to make the shrimp stock.) Season the shrimp with the Essence and black pepper, tossing to coat evenly. Cover and refrigerate while making the sauce base and biscuits. Heat the oil in a large skillet over high heat. Add the seasoned shrimp and cook, stirring, until they begin to turn pink, about 2 minutes. Add the cream and barbecue sauce. Reduce the heat to medium-high and simmer, stirring, until reduced by half, about 3 minutes. Transfer the shrimp to a platter with tongs. Gradually whisk the butter into the sauce. Remove from the heat. Place 2 or 3 biscuits on each plate. 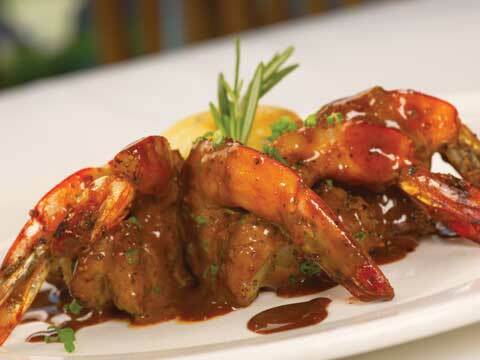 Divide the shrimp among the biscuits and top each serving with 1/3 to 1/2 cup of the sauce. Serve immediately. Heat the olive oil in a medium, heavy saucepan over medium-high heat. Add the onions, salt, pepper, and bay leaves, and cook, stirring, until the onions are soft, about 2 minutes. Add the garlic, lemons, and white wine, and cook for 2 minutes. Add the shrimp stock and Worcestershire sauce and bring to a boil over high heat. Reduce the heat to medium-low and simmer until the sauce is reduced to 1/2 cup, about 1 hour and 15 minutes. Rinse the shrimp shells and heads in a large colander under cold running water. Put all the ingredients in a heavy medium stockpot. Add enough water to cover by 1 inch. Bring to a boil over high heat, skimming from time to time to remove the foam that forms on the surface. Reduce the heat to medium-low. Simmer for 45 minutes. Sift the dry ingredients into a large mixing bowl. Work the butter into the flour with your fingers or a fork until the mixture resembles coarse crumbs. Add 1/2 cup of the buttermilk, a little at a time, using your hands, to work it in just until thoroughly incorporated and a smooth ball of dough forms. Add up to an additional 1/4 cup buttermilk if the mixture is too dry, being very careful not to overwork or over-handle the dough, or the biscuits will be tough. On a lightly floured surface, pat the dough into a circle about 7 inches in diameter and 1/2-inch thick. Using a 1-inch round cookie cutter, cut out 12 biscuits. Place the biscuits on a large baking sheet. Bake until golden on top and lightly brown on the bottom, 10 to 12 minutes. Serve warm.